Ostuni is another small city in Puglia Italy near Cisternino. It is down on the heel of the boot near the Adriatic Sea. These are great cities to walk around and explore. Watch the Youtube video below and come walk with us through though wonderful town. Each Monday we will visit another town on my VLOG. Most will be small mountain towns or seaside resorts but a few will be large famous Italian cities. These small cities are easily reached by car. Parking is easy and free in most but some have pay machines. You simply look at the machine to see the cost and time covered. Put enough coins in to cover your desired time and press the green button. A ticket is printed and you place it on your dash-board. If you like this series of VLOGs, Press the YouTube button on the video below and like it and subscribe to my channel. I hope you enjoy our small walk. Pictures of Palazzo Fizzarotti in Bari in Puglia region of southern Italy. Watch this interesting set of pictures taken in Bari, a city on the Adriatic Sea of Italy. Italy has so many diverse settings from its glorious mountains to its majestic seas. Bari is a beach you don’t want to miss. The video below takes you through the area of Bari. 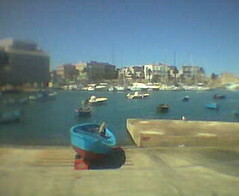 Enjoy and visit Bari soon.